If you want to improve the standard of your oral hygiene through better flossing regardless of price, acquiring the best water flosser could be the answer. A water flosser (or water pick) is a technologically advanced oral health device designed specifically for personal dental care. Traditional dental floss techniques often cause bleeding gums. However, the flexibility afforded by water flossers enables control of both pressure and speed, which means using a water flosser is unlikely to cause bleeding gums. These dental health care devices are particularly ideal for people with braces. Using floss string means inability to access the spaces in-between the wires and brackets of braces as well as the nooks and crannies between teeth. On the other hand, the high-pressure jets of water produced by water flossers can get into these spaces quite effortlessly, ensuring the removal of bacteria, food particles, and plaque. Water flossers also provide enhanced convenience and ease of use since users can clean a particular area by simply pointing the jet and pressing a button. Using a water flosser also ensures a user avoids gum and finger injuries, which are rather common when using the string floss. Studies show that water flossers are not only more effective in cleaning plaque and biofilm, but they also help to reduce gingivitis. 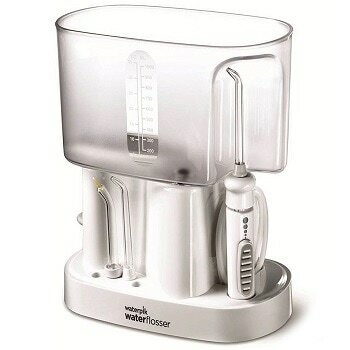 The Waterpik Aquarius is one of the best water flossers currently available. Research shows that compared to regular flossing, it is at least 50% more efficient in cleaning teeth and ensuring bacteria does not build up inside the mouth. Its elegant design features a pressure control that includes an intuitive on/off switch, at least ten different settings, and LED screen. The minute minder and 30-second pacer ensure users maintain the recommended flossing durations. While the featured water tank holds sufficient amounts of water for 90 seconds of flossing, this flosser also features two cleaning modes. The floss mode is excellent for the removal of plaque, and the hydro pulse massage mode is perfect for massaging gums, which improves blood flow. The packaging also includes an orthodontic nozzle, a plaque seeker, pik pocket, and seven tips, all of which provide a viable option for almost every other oral hygiene issue. The manufacturer also guarantees whiter teeth and considerably healthier gums within two weeks of usage. With a compact structural design fitting every single component into a single portable handle, the Jumbl is unique. Soft, normal, and pulse are the three featured cleaning modes. Choosing between the afforded pressures as per personal preferences and needs is, therefore, possible. While the pulse mode massages gums and improves blood circulation, the soft mode is suitable for sensitive gums, and the normal mode is good for natural gums. Apart from being waterproof, which eases cleaning, this flosser is also rechargeable, which is rather convenient for traveling. The packaging includes two rotating color coded nozzles, perfect for multiple users such as couples or roommates. Although in comparison to some of the other flossers its water tank is slightly smaller, it holds enough water for a single flossing session and also includes a mini funnel for easy refilling. 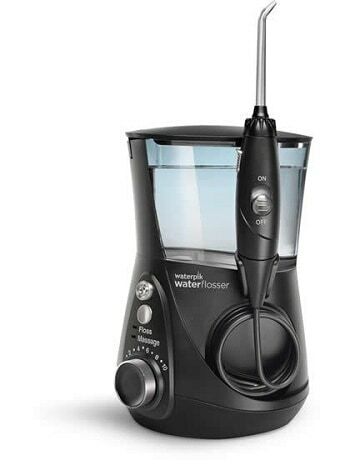 The Waterpik WP-672 provides an easy and more effective flossing technique. It features an all-new tip storage case, LED information panel, an on/off water control on its handle, and seven flossing tips. The featured pulse-modulation technology enables customized water pulsation, which enhances comfort and ensures the best possible cleaning. 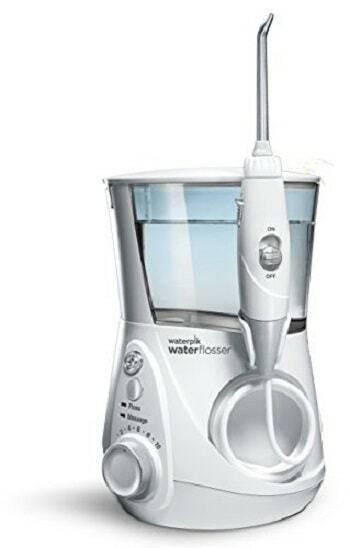 In addition to holding enough water for 90 seconds of flossing, this flosser features ten different pressure settings. The floss mode provides maximum removal of plaque while the hydro-pulse massage mode enhances gum stimulation. The results afforded by this flosser have been clinically proven to be significantly better than those of every other traditional dental floss or toothbrush seeing as it can actually reduce plaque, gingivitis, and gum disease. This flosser is also ideal for people with braces, implants, crowns, bridges, or veneers. This water flosser comes with one flossing tip for the gums and two for your teeth. Compatible flossing tips are presently available for purchase due to public demand, which means multiple users can utilize the same base machine. The sizeable water tank featured holds enough water to last 90 seconds while flossing. You are bound to achieve healthier gums and brighter teeth by using this flosser for just one minute every day. In addition to six pressure settings, it also includes a specialty reservoir, ideal for use with low-pressure antibacterial rinses to ensure the removal of bacteria and plaque. Unfortunately, it might not be a good water flosser for some people since apart from being a little bit loud, it is only compatible with 120VAC/60Hz outlets. With the featured ultrasonic brush head speed of 31, 000 vibrations per minute, an interdental brush suitable for deep cleaning between teeth, and pressurized jets of water. The Wellness Oral Care effectively cleans hard to reach areas such as under the gum line while simultaneously dislodging plaque and germs. While the 30-second interval timer reminds users to change quadrants, a two-minute timer indicates when they should stop brushing. Apart from three cleaning modes, it also features an orthodontic tip, three color-coded brush heads that include removable nozzle tips capable of rotating 360 degrees and DuPont bristles, two standard nozzles, and a tongue cleaner. While the large 5oz water tank holds enough flossing water, charging the integrated battery once allows for weeks of flossing. This flosser also features a lighted mirror, allowing users to view the progress made. It, therefore, provides one of the most advanced oral care techniques. 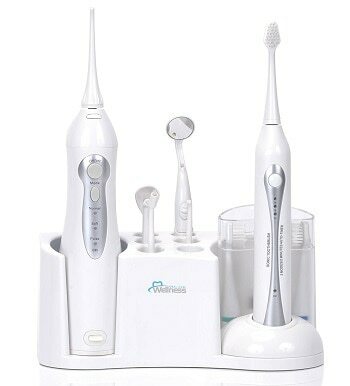 While using any of the five water flossers mentioned above will improve your oral hygiene, the Wellness Oral Care Home Dental Center, is arguably one of the best water flossers of them all considering its features and functional capabilities. However, it is important to note that choice of the most suitable water flosser comes down to personal preferences and needs.